Sometimes tinnitus can occur as a result of an injury or infection, age, or by prolonged exposure to loud noise. Quite often, though, a person will not show any signs of a medical problem. Since there is nothing in these cases for doctors or Ear, Nose and Throat specialists to treat, it makes the condition very difficult to resolve, and there is as yet no known cure. To understand tinnitus, it might be useful to look at how we register sound. With tinnitus, the 'sound' is generated from within the auditory system itself, so there is no external source for the noise. During the normal hearing process, an external source generates sound waves that are picked up by tiny bones and hairs in our ears and translated into chemical and electrical signals by a part of our ear that is called the Organ of Corti. That signal is then sent to our brain to interpret. It is thought that tinnitus is caused by a malfunction in the this process. Just like chronic pain, an individual's relationship with their tinnitus is personal and subjective. When the brain picks up on loud sounds, it triggers a 'flight or fight' response and our bodies response by increasing the level of stress hormones, and very physical responses. Anxiety and stress are our natural responses to this and these are two things that can make tinnitus worse. Some people will experience a high level of stress and anxiety as a result and others will find it more bearable. As the experience of tinnitus is so individual, no treatment will be the same, and it is difficult to say how long a course of therapy will last. Some people will find relief after a few sessions, others maybe eight sessions. So how can hypnotherapy and BWRT (BrainWorking Recursive Therapy) help with tinnitus? 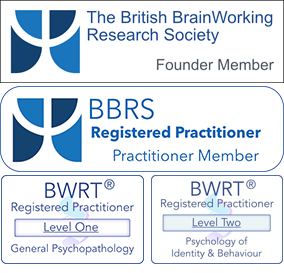 Both BWRT and hypnotherapy can be very effective in dealing with the psychological aspects - the anger, stress and anxieties resulting from tinnitus. A sufferer will probably already know that focussing directly on the noise can seem to amplify it; on the other hand, distractions can help to ease the noise, especially in those quiet times when it seems more apparent. I would always insist that a client has consulted a medical professional before commencing treatment to assess whether further medical attention is necessary. Whilst it might not be possible to remove the tinnitus, we have an element of choice in how we respond to it. Hypnotherapy can act on a subconscious level to assist in the reduction of hypervigilance - that habit of constantly looking out for the noise to reappear. Many people with tinnitus see it as a threat and are frustrated at the ability to fight it. Therapy can also help to reframe our attitude towards this condition, allowing us to regain control over our feelings and perceptions, with the overall result being a reduction of the distress that so often accompanies this condition. I offer hypnotherapy and BWRT for tinnitus relief from clinics in Northallerton and Skipton, with a free initial consultation available.